A 1950’s inspired tractor can be mobile or set up permanently. 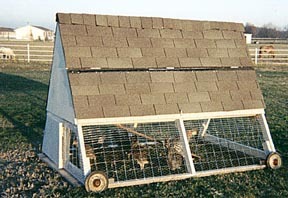 Enclosed are pictures of the chicken coop or perhaps more accurately, chicken tractor I built. I modified the plans and the coop in the photos is the result. I don’t know that I would shingle the roof again, that added a great deal of weight. I would have used galvanized steel or aluminium roofing. 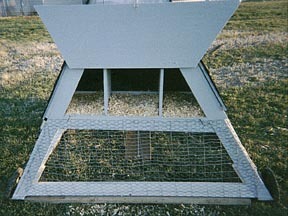 I would also have moved the bottom door to below the nesting box access panel so all access would be on the same side. Sometimes you just have to build something to discover where to make improvements. 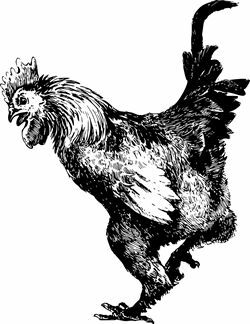 I currently have 8 chickens in the coop, a trio of Dominiques, 2 Americaunas, a bantam cochin and 2 Old english game hens, in one of the pictures you can see Big Dom my rooster. The Dominiques are about 6-7 months old and were laying the first week we had them, but stopped when they started to moult (shorter days-decreasing light???). I wanted to add light to increase the amount of daylight to stimulate laying, but am worried about the other younger pullets (3 months old). 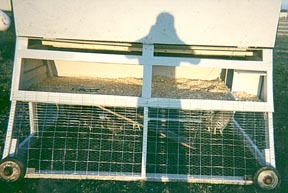 I had read that increasing daylight to pullets can cause them to start laying too early resulting in prolapse and permanant injury or death. If adding lighting, I will utilize solar charged batteries, florescent lighting and a timer to retain mobility.